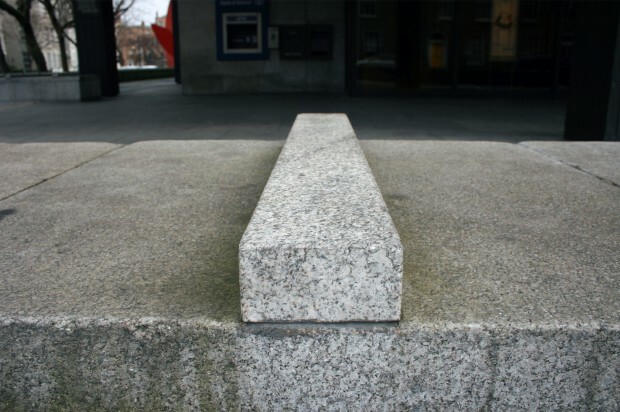 The smooth, low granite wall in front of Bank of Ireland on Baggot Street is interrupted by regular strips of stone stuck across its width. 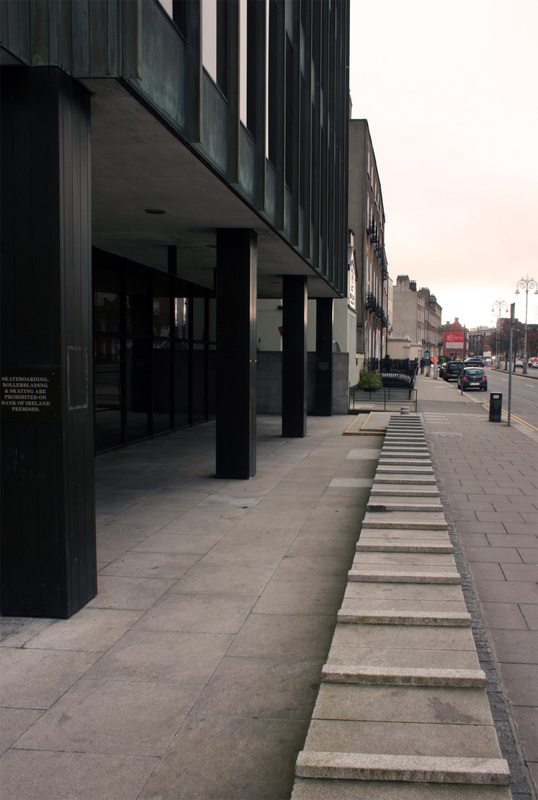 Like most major urban buildings, Bank of Ireland was modified to deter anti-social uses of the furniture and hard landscaping – interruptions in the surface make it less enticing to skate on, or to sleep or lie or anything other than the intended use as a seat. As well as fear of insurance claims or other anti-social behaviour by loitering groups, skateboarding can scrape and erode surfaces, causing physical damage to the building. From another perspective, this is as much a part of the life of the building as weathering, like the bank’s bronze oxidising or the slow staining of concrete over time. Iain Borden (now a Vice-Dean and Professor of Architecture and Urban Culture at the Bartlett School of Architecture) has written extensively about skateboarding and cities, including Skateboarding, Space and the City, a serious and brilliant work combining his interest in theory with his own history as a skateboarder. “In street skating, the constant planting of hands and feet build gradually to create a grubby reminder of skaters’ presence. Urethane wheels and painted deck graphics similarly leave technicolor streaks across walls, ledges and benches. In particular, skateboarders grind their trucks on the edges of walls and street furniture, leaving a series of gouges and striations that ultimately lead to the rounding-off or breaking up of edges, cutting a ragged silhouette. […]” Borden puts this in the context of buildings as ‘writing on the city’, where owners and managers get to make the imprint, and the rest of the city’s recorded through responses like flypostering, graffiti, children’s chalk marks, or even litter and the wear from footfall. I love architecture and the built environment, but best of all when it’s being used as a seamless playground by good skaters. I used to work near Baggot Street, with the high point of every dull day being the twenty-minute escape to Bank of Ireland to deposit the shop’s takings. The security guard was a friendly, talkative middle-aged man who said he was a little disappointed because he didn’t mind the skaters. Besides, they were listed on the internet (the internet!) 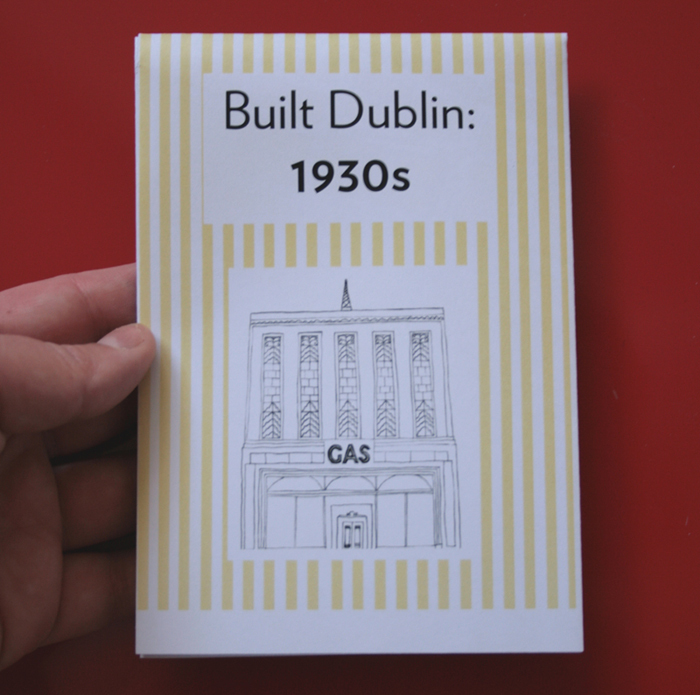 as one of the best spots in Dublin, and people used to come from as far as Roscommon.